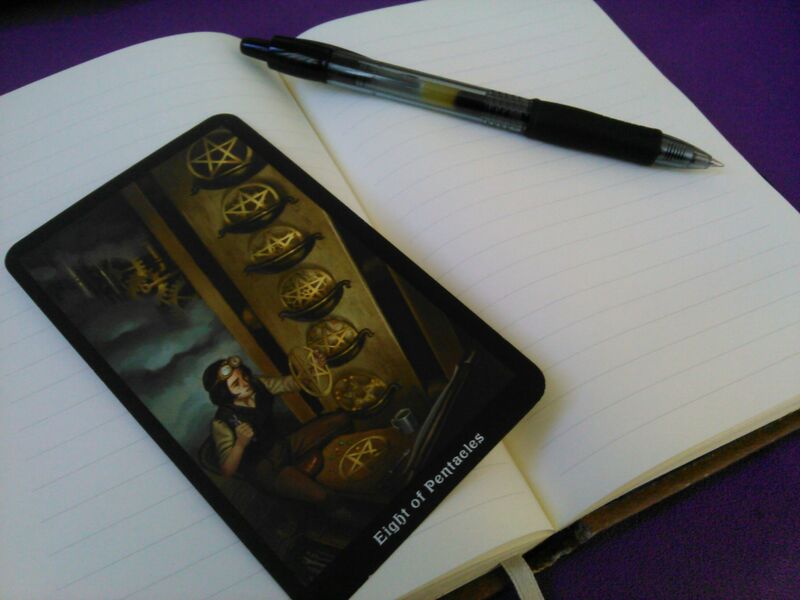 This is another post for those of us who are writers as well as tarot lovers…or for any writers who find the idea of using tarot to enhance their writing, intriguing. My Plot Development Tarot Spread was such a hit that I decided to post a couple more spreads for you to try out in your creative writing practice. I actually have a ton of these, so this will be Part 1 and if there is continued interest, then I will post more in the future. 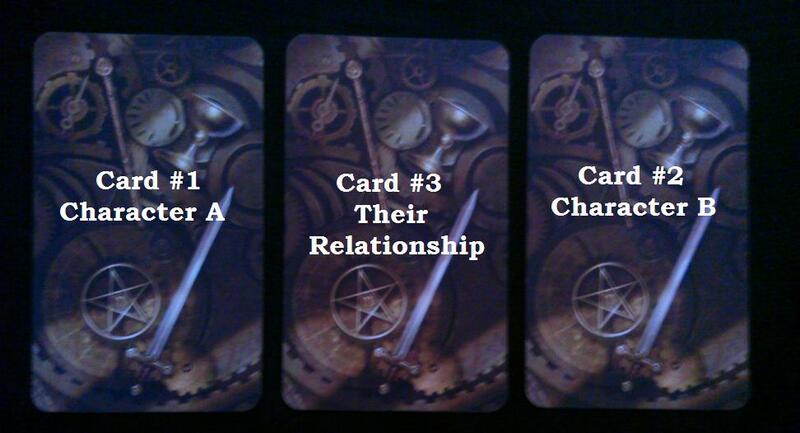 Unlike the Plot Development Tarot Spread, these spreads are short and sweet, only three cards each. Its enough to get your creative juices flowing, without being overwhelming or too time consuming. 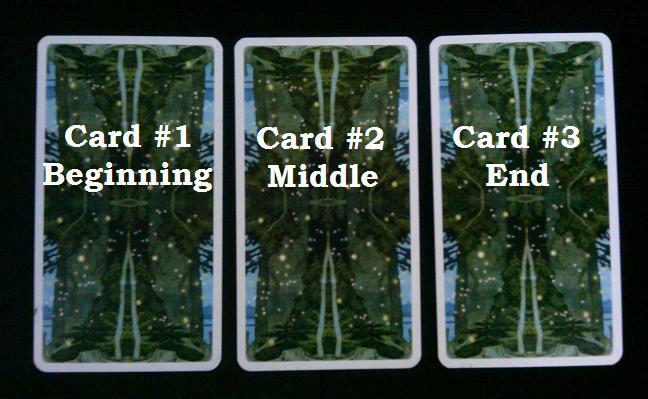 So without further ado, here are three 3 card spreads that you can use to inspire your writing projects. In general this spread is pretty self explanatory. It just gives you a very broad outline of what your story arch could look like. Card #1: Beginning – This part of the story is where you set everything up, introduce your characters, setting, situation and conflict or story catalyst. Card #2: Middle – This section usually involves the meat of the plot. This is when journeys take place, information is gatherer and events occur which either help or hinder the protagonist. Card #3: End – The end is the culmination of the story, all the elements from the beginning come together and we get some sort of resolution. This can be a grand final battle, a character has an epiphany, they become who they were always meant to be, they defeat the antagonist, the find what they were seeking etc. Similar to the first spread, this spread tells you what your story arch could look like, however with this spread we are getting more specific. Instead of a very broad picture of what is going on, this spread gives you ideas about why things are unfolding the way they are. Card #1: Situation – This card represents the catalyst for the story. It is the things that must be resolved, dealt with, avoided, stopped, changed etc. Essentially, it is the reason that the tale is happening. 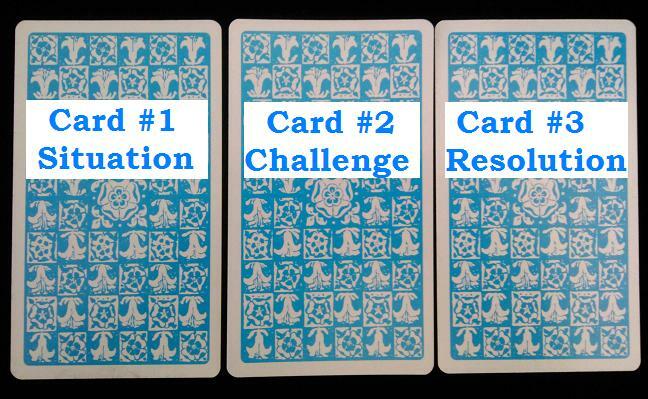 Card #2: Challenge – This is what makes resolving the situation so tricky. This is what the protagonist(s) must overcome or do to enable a desirable outcome. It may also indicate the solution to resolving the situation. Card #3: Resolution – The resolution card represents how the situation is ultimately resolved, or not resolved as the case may be. It illustrates how or whether the protagonist is successful or unsuccessful or maybe something in-between. Card #1: Character A – This card indicates the personality and attributes of the first character that you are examining, as well as characteristics that may effect how they get along with Character B. Card #2: Character B – This is the other character or entity that you are looking at. Like card #1, this card explores the attributes and personality of this character, especially in relation to how they react or interact with Character A. Card #3: Their Relationship – The word relationship isn’t implying something romantic, it could, but its more about how the characters relate to each other, how they feel about each other and how they act around each other. This card sums up what that looks like. Well, there you have it. 3 spreads to help invoke the muse. I hope you enjoy and use these spreads. Please let me know what you think if you try them out. Until next time, keep on writing. Check out Three Card Creative Writing Spreads – Part 2 for more creative inspiration. I hope you enjoy! That’s wonderful to hear, Lauryn. I hope they enjoy it.